Consecration of Archbishop Shandu. This ceremony is described in Martin West, Bishop s & Prophets in a Black City, pp 56-7. It was held in Thokoza township on the East Rand in a hired classroom, starting in the evening and lasting well into the next morning. Archbishop M P Radebe of the Bantu Bethlehem Christian Apostolic Church of SA (1) presided. Five churches were represented. Archbishop & Mrs Shandu are kneeling in the centre, with Archbishop Radebe at left. 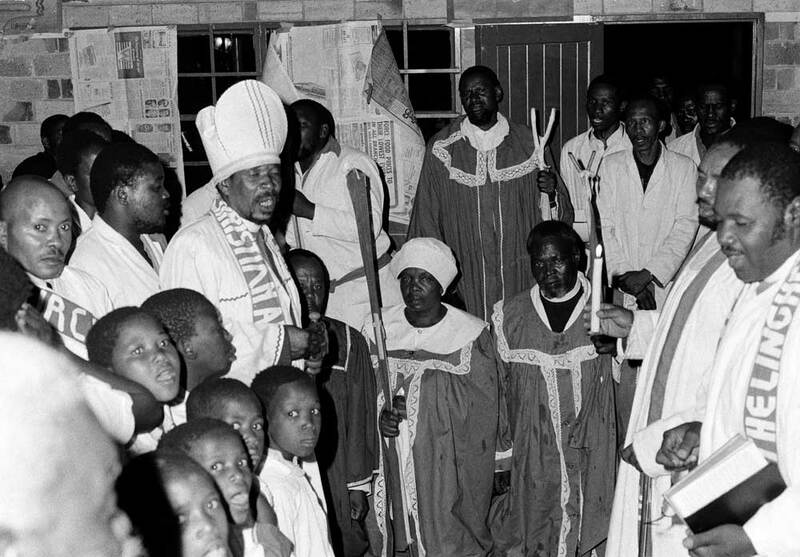 West, Martin, “Archbishop Shandu and wife kneeling at consecration ceremony, Thokoza township,” Martin West, accessed April 20, 2019, http://www.martinwest.uct.ac.za/items/show/10438.